If you are interested in a Dana or Dana Wireless device, feel free to email me here, as I know a few friends who might have one or two available for sale. I can't guarantee anything, but I can certainly see what my connections have in the way of gently used Dana and Dana Wireless devices. It's spring cleaning at Rohdesign! Since my readership includes many tech people, I wanted to offer my extra gadgets here first. This versatile and unique device is a great writing tool. Even better, it has super-long battery life. I've had about 16 hours use from the Dana when WiFi is deactivated (for writing). I did an IRC chat test, with the WiFi fully active, and got about 7 hours. 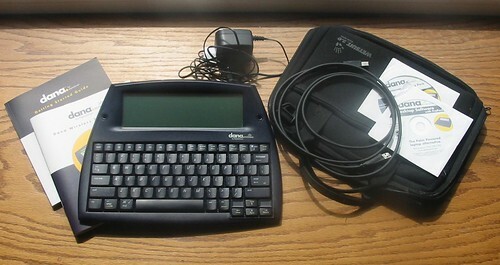 The Dana Wireless can send pages to printers with a dedicated USB port for this purpose (1 of 2 USB ports), act as a keyboard on a PC or Mac and sync as any good Palm OS device can. It even has dual SD card slots, so you can have more than one SD card in use at a time. I've found the Dana useful for mobile email, IRC, IM chat, and especially for writing. It comes with AlphaWord, a variant of Wordsmith, that takes advantage of the wide screen and has a special "Send" function that can fire your written text via USB cable to any text editor window on your PC or Mac. The Dana Wireless is in great shape, as I've sparingly and lovingly used it for writing, email, chat and even a little web browsing. It comes with original CDs, power supply, USB cable, and manuals. I'm throwing in a 64MB SD card and a Wetsuit 2.0 case for easy carrying to the cafe. I'm asking $300 for the Dana Wireless and all of the extra gear; retail for the Dana Wireless is $429. If you're interested, drop me a line with "Dana Wireless" in the subject line to work out the details.